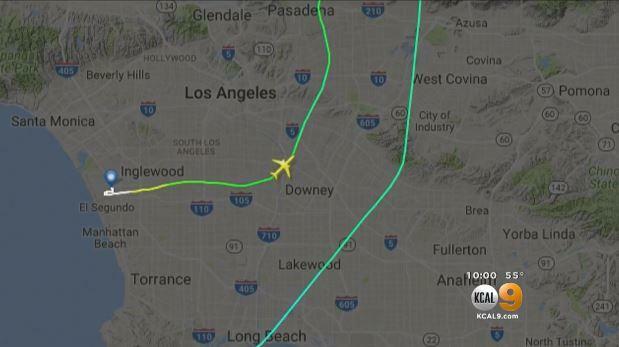 LOS ANGELES — The Federal Aviation Administration on Monday was investigating a jumbo jet’s turn in the wrong direction after it departed from Los Angeles International Airport on Friday, reports CBS Los Angeles. The EVA Airways Boeing 777 bound for Taipei, Taiwan, flew north instead of south after departing from LAX early Friday morning, according to the FAA’s Ian Gregor. “At the time, aircraft were departing from LAX to the east,” Gregor said, adding that the EVA flight departed from the airport’s south runway complex. The 777’s flight crew switched from the LAX control tower to the approach control in San Diego right after takeoff, Gregor said. “The air-traffic controller at the approach control who was handling EVA instructed the pilot to make a left turn to a 180-degree heading,” Gregor said. The jets “remained the required distance” from one another, he said. The plane turned low over an Altadena neighborhood, startling at least one homeowner, who said it tossed her from her bed. The plane was heading dangerously close to the San Gabriel Mountains and was far below the summit of Mount Wilson at 5,700 feet. With moments to spare, pilot changed course and headed back toward the ocean. Gregor said that FAA regulations require aircraft to be at least 3 miles away laterally or 2,000 feet vertically above obstacles, such as mountains.